Masking Tape – Tape Solutions, Inc.
Masking tape is the easy-to-tear, pressure-sensitive tape that was one of 3M’s first and most successful products. It is used as a common household item and in a variety of industrial applications that require masking off areas for a multitude of reasons. Examples of such applications include etching, plating, power coating, soldering, sand blasting and flame or thermal spray techniques. Unlike marking tape, masking tape is designed to come off easily without causing any damage to the object it was attached to, and therefore does not have the adhesive strength of marking tape. Masking tapes are usually a tan or light brown color, and those made specifically for painting are often purple or bright blue. The color variety is not as creative and loud as duct tape, but it is still very popular amongst painters in particular. It is also used to close and secure packages, although not as often as packaging tape is used for such applications. 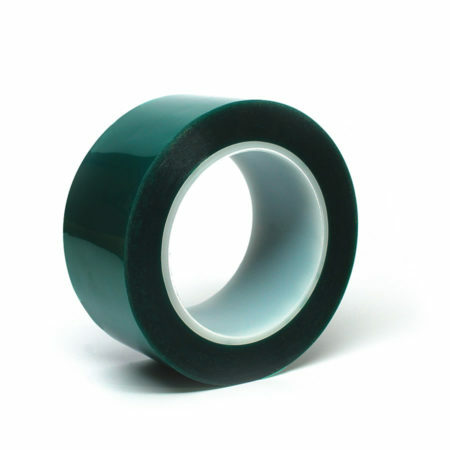 Masking tape’s backing is most commonly made of paper, but manufacturers sometimes use polymer or polyimide films, polyester, glass cloth, foil, vinyl or layered materials that are laminated together. The adhesive varies according to the function of the tape. Rubber-based adhesives offer the strongest hold, but have the lowest temperature resistance. Acrylic-based adhesives have a wide temperature range (from sub freezing to 325°F), while silicone-based adhesives offer the greatest temperature resistance (up to 500°F). The adhesive strength is also based on a one to one hundred point scale. Usually, masking tape adhesives used for painting are rated around fifty. However, household masking tapes have adhesives placed much lower on the scale, so that no damage is done to sensitive areas that do not require the extra strength. Because it is often used in bulk, to mark off large areas or multiple objects, masking tape is sold in packages of three or more rolls together as well as individual rolls. The roll has been specifically made with movement in mind since it is a large enough roll to comfortably wear on a person’s wrist. Marketing points like these are what keep masking tape in demand. 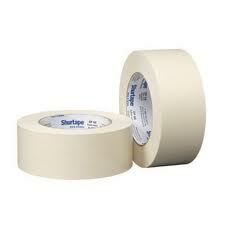 Masking Tape Masking tape was invented in 1925 and used by the auto industry to paint two-toned cars. It doesn't damage newly painted surfaces or leave behind unwanted residue, making it exceedingly useful for painters when they mark off areas that should not be painted and paint straight edges.